Map at Kiosk. Most tees are marked. Good use of the land given. In a flood plain with some trees and elevation. Sidewalks and across OB. Redesigns in 2010 and in 2015 with alt positions for: 1,4,7,8,9,10,11 and 17. Alt positions roughly marked on tee signs. Between Beltline and Keller Springs on Josey Road, east side just south of RR tracks. I play this course often and it has been upgraded with concrete pads throughout and consistent maintenece to keep the grass down. Between greenbelt park up the road and this course, this course is definately the better. The creek that runs through many holes can definately make for a long day but it also makes the course very unique for a greenbelt course. When the weather is nice the course can be crowded but if it ever seems too slow just head up the road to greenbelt park disc golf course. Hole #6 is the hole to beware of, i've lost numerous discs throwing over the river and through the trees- but when you hit the line it makes for an awesome shot. 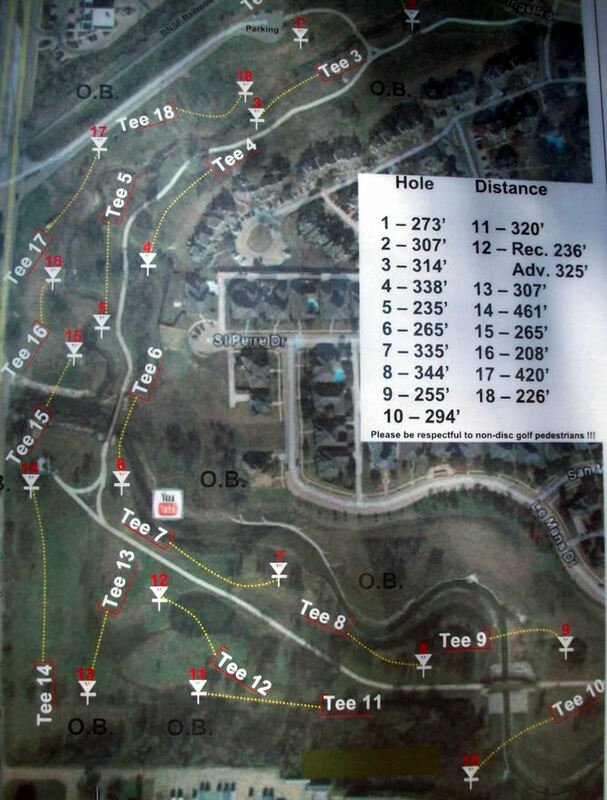 Overall the course was well planned with great amenities. The recent addition of park benches and extra trash containers has not only made the course more aesthetically pleasing but cleaner. Also, signage was added to each hole for an clearer picture of course play. I enjoyed the length variation and the fact that almost all holes could be attempted in multiple ways. My main concern came with the teeboxes which traffic has not treated well. They are several that are dug way in with many uneven surfaces. The tees are not consistent in the fact that some are boxed while others are just a board at the front of the tee. Some of the chains in the cages are broken which was very disappointing. In my opinion the course equipment needs an overhaul but I was still very satisfied. I really love to play this course, but it is very unkept with lots of tall weeds and brush. Last few times I have played, I have returned home to find my legs covered in chigger bites. Although I spent the next few days scratching my skin off, I still go back for more abuse. Really a fun course with a good mix of holes. I would recommend playing here. Some elevation changes on the front 9. A creek winds through about half the course and there are OB threats on almost half the holes providing some risk/reward. 4 pin placements are nearly completely surrounded by trees or brush, with another 6 holes within 30 feet of the creek making birdies more difficult although nearly every hole is within driving range. OVERALL-Fair course for both left and right handed players. This courses loses a few points with me due to the high probability of either losing a disc or will have to go swimming within the first 6 holes, no concrete tee pads and even some of the natural tee boxes are still a work in progress, and basket quality is poor on a few holes.